Ibn-Alhaytham Pharmaceutical Industry - The Launching of Fexofenadine D24 through a Lecture Titled " Fexofenadine Bilayer Tablets… Unique Formula "
The Launching of Fexofenadine D24 through a Lecture Titled " Fexofenadine Bilayer Tablets… Unique Formula "
Ibn Alhaytham Pharma recently presented two lectures on April 2011 at Zamaraya Hotel in Aleppo and Four Season hotel in Damascus . The lectures were titled as " Fexofenadine D24 Unique Formula" . The lecturer was the , Product Manager , PH. Mazen Sabouni . The lecture was about launching Fexofenadine D24 " an Anti Histamine and an Anti congestion Drug " which was newly presented in the markets . 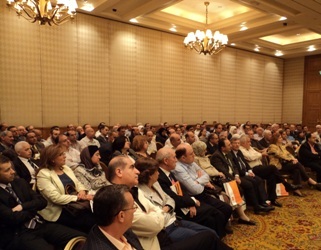 A group of ENT doctors from Aleppo and Damascus attended the lectures in which they had a long discussion about the product and the new merits it introduced in comparison with other products in the Pharmaceutical Market , where it covers Symptoms for 24 hours as a result of its Distinct manufacturing method. Ibn Al Haytham Pharma added Fexofenadine D24 to its products line in addition to Fexofenadine group . This product is distinguished by its distinct manufacturing method. It consists of two layers : Fexofenadine layer which is released directly in the human body to give its effect as an anti allergic drug , and Pseudoephedrine Layer which is extended to ensure efficacy for 24 hours as an anti congestion drug and to reduce side effects.